As of 26th October 2016 this site will undergo a change of administration. Please direct any queries to bwmp2015@gmail.com. We usually hold a General meeting in October. 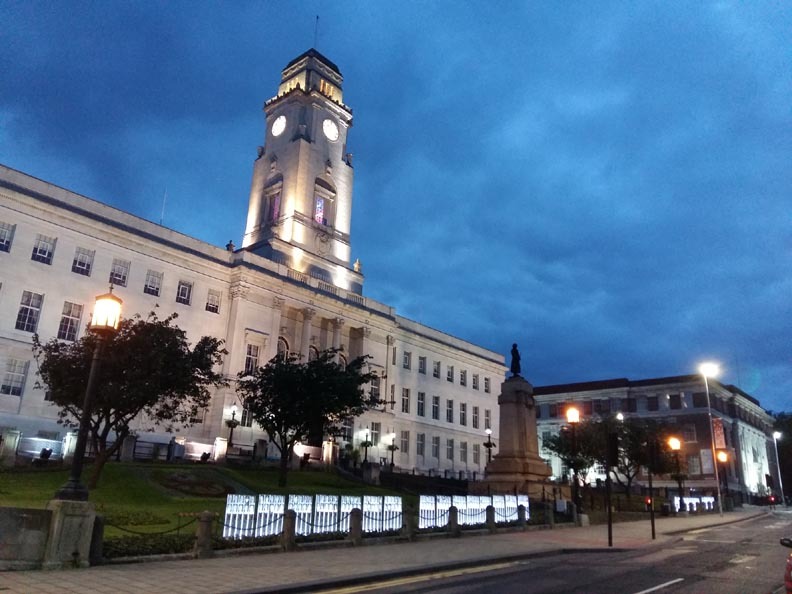 We have the offer of a room in Barnsley Town Hall (thanks to Barnsley Archives) on a Tuesday morning from 11am to 12 noon. 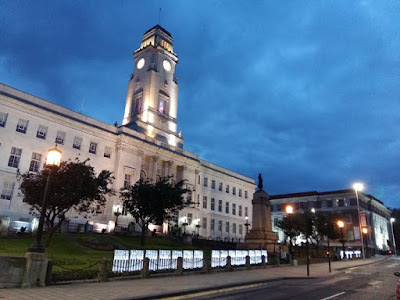 This meeting has now been confirmed for 25th of October in Room 10 of Barnsley Town Hall at 11am for one hour. All welcome. 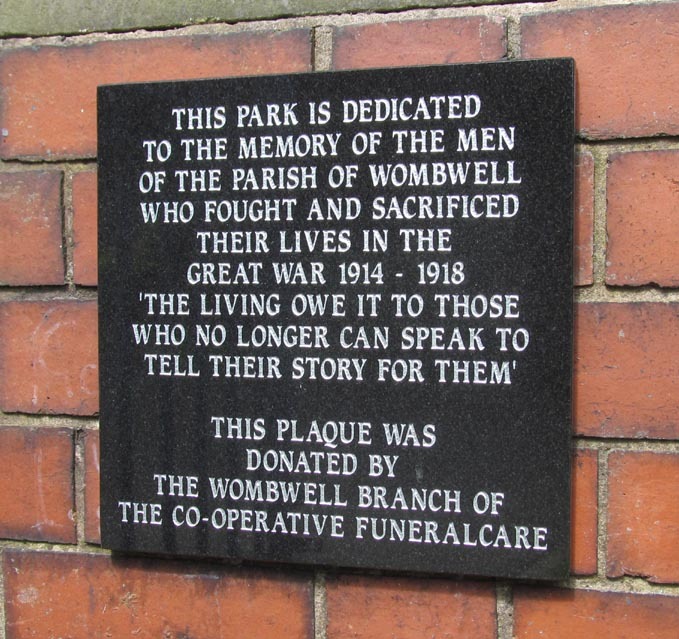 Reports from local Barnsley groups researching their memorials and men would be welcomed. Last year we were visited by Councillor Joe Hayward who spoke about Barnsley Council's Somme100 commemoration plans. Can anyone suggest a speaker or visitor for this year? Should the BWMP join the Barnsley Museums & Heritage Trust, as a group? 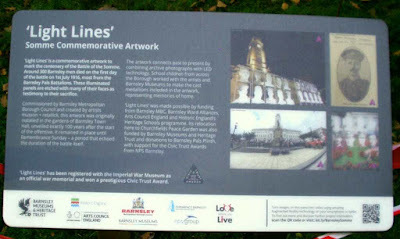 This would entitle us to attend events at Experience Barnsley and network with Councillors and Heritage organisations. How are we going to produce and fund our Roll of Honour? Loose leaf folder or try for some funding for a proper book or books? Could we work with similar groups in other towns, eg Sheffield, Doncaster, Rotherham, Wakefield and so on? Would we be interested in getting involved in such a project with large scale Lottery funding if one was set up? 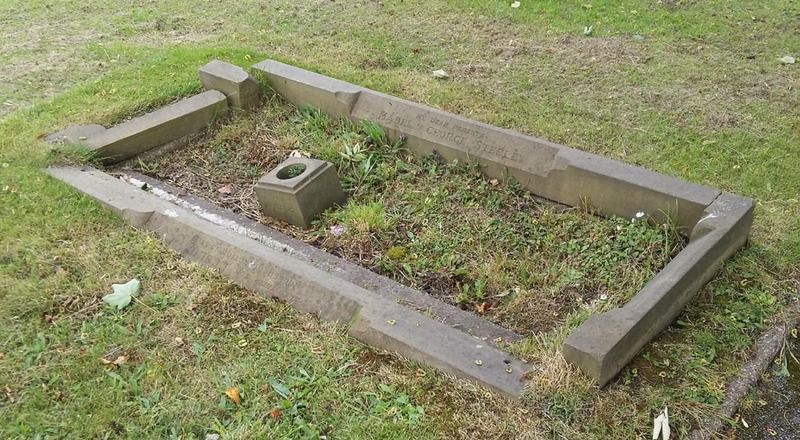 We were offered free training by Civic Voice in surveying the condition of our war memorials and submitting reports to the War Memorials Trust. Shall we take up this offer? The Imperial War Museum's War Memorials' Register defines a War Memorial as "any tangible object which has been erected or dedicated to commemorate those killed as a result of war, conflict or peacekeeping; who served in war or conflict; or who died whilst engaged in military service." This includes gravestones which commemorate a casualty buried elsewhere. 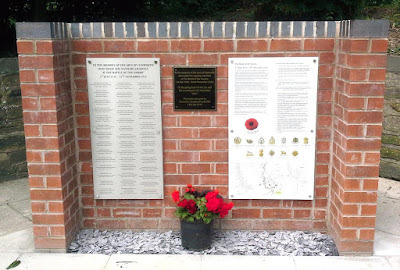 There must be a clear statement on the memorial (or in a printed document such as a newspaper report from the time) that defines the commemorative purpose of the feature and reports its erection. The full wording of their definition can be found here. 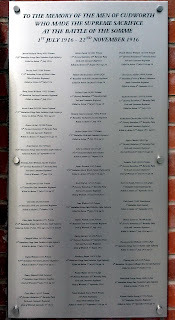 In the list below, where the names is blue click to follow the link to a page with a larger photograph and more information. 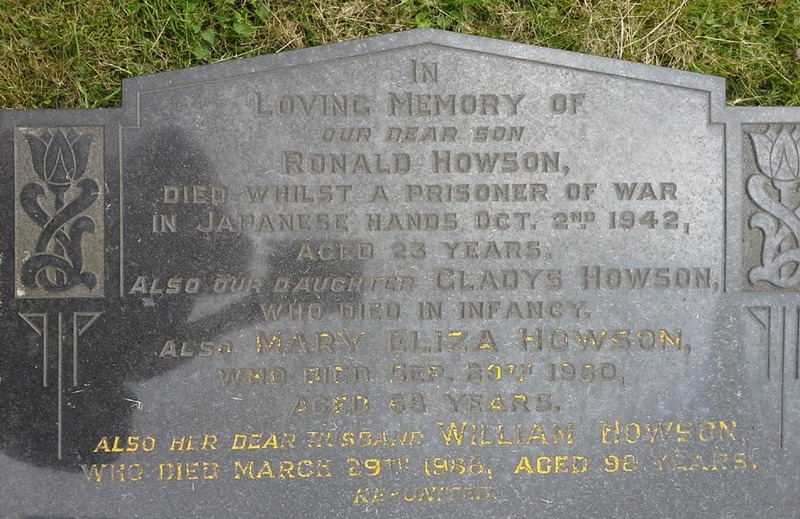 Ronald was a Leading Sick Berth Attendant on the H.M.S Tamar and he is remembered at the Plymouth Naval Memorial and commemorated on the Commonwealth War Graves Commission website. He is buried in Argenta Gap War Cemetery in Italy and commemorated on the Commonwealth War Graves Commission website. He is buried in Kanchanburi War Cemetery in Thailand and commemorated on the Commonwealth War Graves Commission website. 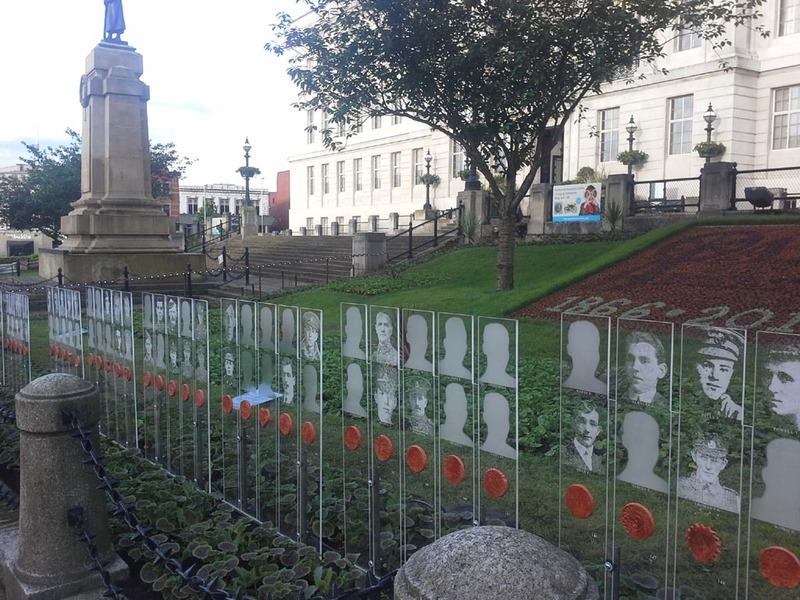 There is no interpretive panel as yet for this temporary war memorial which commemorates Barnsley Men who Fell on the First Day of the Somme. Details will be added here when we have them. The artwork will remain in situ until Remembrance Sunday 2016. We do not know what will happen to it after that. 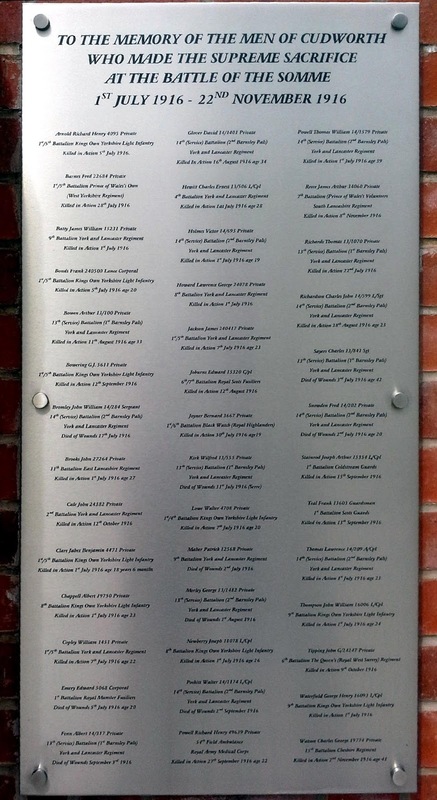 Note added 13 August 2016: The Council have now improved their information about the artwork and several pages of information, including a downloadable list of the soldiers' names can be found on their website here. Note added 28 August 2016: A QR code has been added to the ends of the displays. Visitors are invited to scan it for more information on the artwork. We lack the technology to check but assume it points to the Council website linked here. Note added 21 December 2016: The artwork has been awarded a PRO TEM award by Civic Trust Awards. The Pro Tem Award is presented to a temporary building, structure or space. 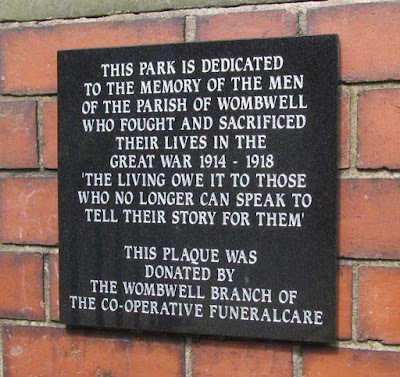 Note added 21 April 2017: It was reported in this week's Barnsley Chronicle that with the support of the NPS Group the memorial is to be reinstated somewhere in Barnsley town centre, subject to planning permission. 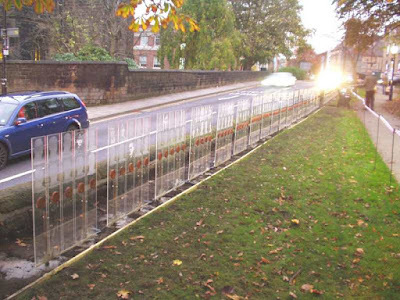 Note added 24 October 2017: The artwork is to be installed in Churchfields Gardens opposite St Mary's church. For more information see here. Now with added interpretation board. The artwork, which was created by artists [musson+retallick] consists of 30 perspex panels divided into 5 vertical strips which each bear the names of two men. For around half the names a photograph of the man has been reproduced, otherwise a generic silhouette has been used. The panels are laid out along the pavement edge of the gardens in front of Barnsley Town Hall with small gaps between each large panel. At night the panels are illuminated by white led lights and the light is refracted along the edges of the panels and boundaries of the strips. Below each two names and images is a disc shaped brown object, this is a piece of local children's clay artwork, cast in resin and attached to the plaques. Each item is numbered and an index to the pieces with the names of the children who created them can be found on the Barnsley Council website, here. We have called the groupings Panel Set 1 to Panel Set 30 for ease of reference, looking a the artwork from left to right. Where further information on a name has been researched by our volunteers it will be linked here (look for the names in blue) to a page on this site or to an external site. It is possible that research has turned up an image of a soldier not included on this memorial so please follow the links. On this special memorial artwork we have indicated where an actual image of the man is present with a * Also note the symbol ^ which indicates a note about this man at the foot of the page. Victor Holmes, panel set 4. It has been proven by a relative that this image, from the Barnsley Independent in 1916, actually shows Victor's brother Harry Holmes who survived the war. Thomas West, panel set 4. The image above this name is actually that of Thomas Goldsby West whose name in on panel set 7. Charles Sayers, panel set 6. Sources differ, but this man did die somewhere between 1st and 3rd July 1916. J Jackson, panel set 7. This is an image of James Jackson from Cudworth who was killed on 7 July 1916, it should be John Jackson from Barnsley killed on 1 July 1916. Thomas Goldsby West, panel set 7. For an image of this man see West T, panel set 4. W Atkinson, panel set 9. This man did not die on 1 July 1916. We are trying to find out who this image shows. W M Beckett, panel set 11. 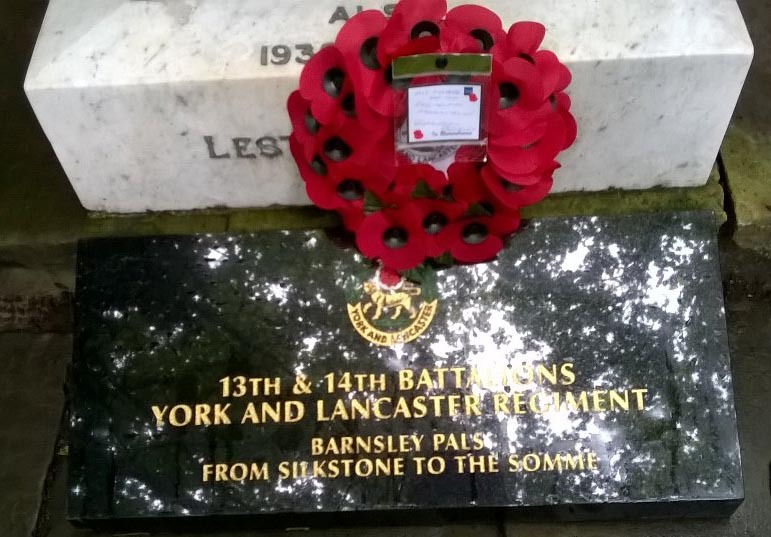 William Beckett (no M) who died on 1 July 1916 was in the 13th Btn, York and Lancaster Regiment. Is the cap badge shown on the image that of the Y&L? H Smith, panel set 11. No-one from Barnsley called H Smith died on 1 July 1916. W Harris, panel set 12. This photo is of Wilfred Harris Lavender. A Robinson, panel set 12. Either Andrew Robinson or Arthur Robinson. The other A Robinson is on panel set 25. We are trying to find out who this image shows. J Marshbank, panel set 12. Should read Marchbank. C C Thompson, panel set 13. This image shows Cecil Cuthbert Thompson who was killed on 14 July 1916, it should probably have been Charles Thompson from Darton who was killed 1 July 1916. E Clowery, panel set 14. Should read Clowrey. J Henighan, panel set 15. This man was killed on 1 July 1917. Included in error. Matthew Sanderson, panel set 17. This man died on 4 July 1916. It is possible he was included in error in place of Louis Sanderson who died on 1 July 1916. S A Beache, panel set 19. Should read Beacher. E Jones, panel set 22. This is Ernest Jones from Wombwell who was killed on 10 January 1917. 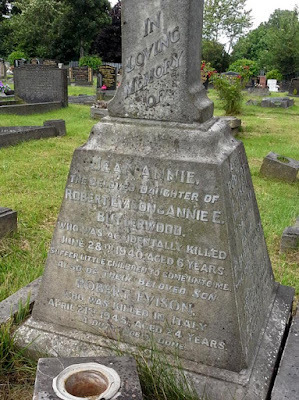 The man who died on 1 July 1916 was Edward Jones from Barnsley. John Richard Smith, panel set 22. This man was reported missing at Mons and subsequently presumed dead in October 1914. 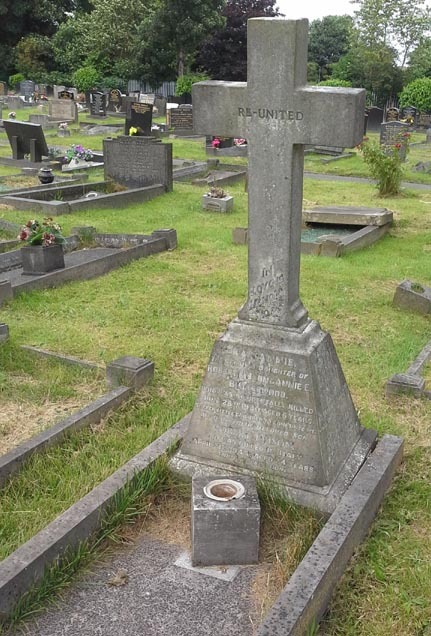 He was one of five brothers who served, one of whom, William Smith, was killed on 1 July 1916. Probably have been meant to be Joseph Smith who was reported missing on 1 July 1916. A Robinson, panel set 25. Either Andrew Robinson or Arthur Robinson. The other A Robinson is on panel set 12. We are trying to find out who the image there shows. J W Kevitt, panel set 26. This is John William Kevitt who was killed on 6 July 1916. Probably meant to be his brother Ernest Kevitt who was reported missing on 1 July 1916. F Nuttal, panel set 26. Should read Nuttall. H Turner, panel set 27 & 21. Only one H Turner from Barnsley died on 1 July 1916. Herbert Turner from Royston died on 1 July 1916, his photo appears on panel set 21. The image above H Turner on panel set 27 is actually Richard Turner of Monk Bretton whose name appears on panel set 20 below a blank profile. Joseph H Turner died on 1 July 1916, but his picture does not appear in either local newspaper as far as we can tell. F H Cave, panel set 29. This man died on either 1st or 2nd July 1916. Thomas York, panel set 30. This man, is the brother of Henry York on panel set 19. Although he was originally reported missing it was later discovered that he had been taken prisoner, and happily he survived the First World War.